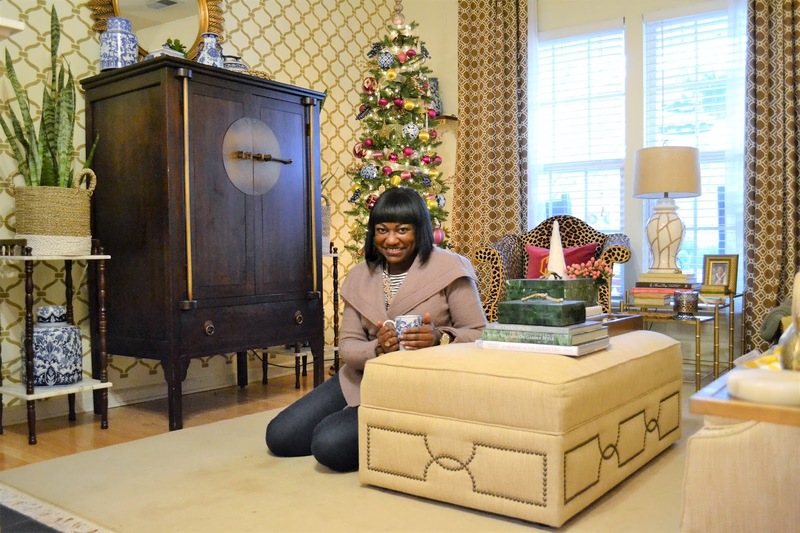 Dwell by Cheryl: "All Through the House..."
It seems that with each passing year, my desire for simplicity during the holiday season increases. Now more than ever, I just can't seem to bring myself to unload all of the contents of those Christmas bins, stored in my garage, inside my home. These days, I carefully sort through the items seeking out my favorites to display for the next month or so. 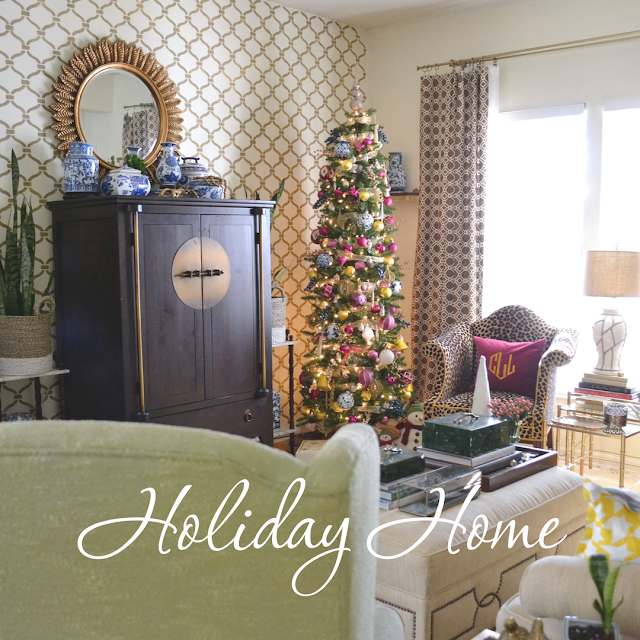 Today, I'm opening my doors to share with you my super-simple, pared down holiday home. Sometimes it's the littlest treasures that bring you the most joy. I love this sweet golden nativity. I placed it at my entry and it's a wonderful reminder of the true meaning of the season. As in previous years, my holiday décor is designed to work with my existing color scheme. It's shifted over the years but I prefer it this way. I makes me feel like it's the holidays but my home still maintains its usual flare. I added a touch of blue and white to the holiday décor this year. Since my new collection has all but taken over, it was important to be sure to tie the Christmas tree décor in with it. A few new blue and white porcelain ornaments from Ballard Designs and some strategically placed blue faux berries did the trick. I'm obsessed with this fuchsia Christmas cactus. Scored this baby at Wal-Mart and the intense pink stopped me dead in my tracks. I'm just hoping I have enough light to keep these beautiful blooms going all season long. Wowza! I really like keeping things simple. I'm sure I'll be glad I did when January rolls around. The office could use some greenery, but for now those precious ceramic trees and a pennant will do. This year I longed for my keepsake ornaments to be in view, so I purchased this little pine tree at Wal-Mart as well and threw it in a basket and added lights. It's wild but one of my favorite new additions. In the kitchen, it was as easy as a few plants. These red tulips add just the right holiday touch. And poinsettias are always a classic symbol of the season. I chose yellow to work a little better with the existing color scheme. The bedroom is not to be overlooked. I absolutely love having a tree to fall asleep to the flickering lights and warm glow. I also pulled out the fall plaid pillows and worked them in here. The simple addition of a monogrammed lumbar pulled it together quite nicely. Finally, I added a few touches to the front porch including my vintage sleigh and a faux poinsettia. Note: My newly painted red door is still looking good! See, holiday decorating doesn't have to be complicated. I'll enjoy every simple addition to my home for weeks to come. Your holiday decor is beautiful Cheryl. Happy Holidays to you! You are amazing!Your holiday touches, simple and elegant!! !